You are currently browsing articles tagged Trader’s Joe Address in Plano. 29th Annual Dallas Home and Garden Show would be a great idea to visit who has a house or planning to buy a new one. It is also a great opportunity for Real Estate Investors in Dallas to see new ideas, new materials and meet new vendors. It is the best place to find the BIG savings for your home and garden in this year. Network with area’s finest home improvement experts and receive show only discounts. Don’t miss the opportunity of upgrading your home with fantastic deals. You will see new product pavilion, Dallas County Master Gardeners Stage, Learn the latest trends of gardening, outdoor living designs, Find out new Green Energy products, Fantastic home décor concepts, remodelers, building products, kitchen, bath and more product features. This great show is at Dallas Market Hall, show starts at September 8th Saturday at 10am till 7pm and Sunday September 9th 11am to 5pm. This great event’s admission is $10 for adults and $9 for seniors, kids under 14 are FREE. There are going to be great seminars from how to stage your home, growing your own vegetables, landscaping in Dallas, water wise gardening in Dallas, lawn care in Dallas, curb appeal in Dallas area to latest trends of faux painting that you will learn many great ideas that you can use your next Dallas home. After the show, if you got a fever to do investment in Dallas area or just to buy a new home to customize and update for yourself I will be happy to help you on your search for Dallas Homes for Sale, Plano homes for Sale, Richardson homes for Sale, Dallas homes for lease, homes in Frisco, Prosper, Coppell, Townhomes in Uptown Dallas, Condo in Dallas, McKinney homes for Sale, Carrollton homes for sale, Farmers Branch homes for sale and surrounding DFW areas. One way or another there is going to be a battle this weekend in Dallas that you may already heard about it! It’s the time of the year for the Tomato Battle… Are you ready to crush some tomatoes? It isn’t a waste of tomatoes, these are the ones being really really bad that nobody can consume, they are basically a waste. Bring your attitude but leave your nice clothes at home and kids under 14 can’t join. It is going to be on Saturday September 8,2012 from 12pm to 7pm. 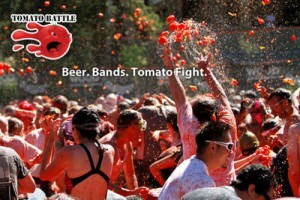 Dallas Tomato Battle address is 3921 Martin Luther King Jr Bl Dallas TX 75210 at State Fair Grounds. What about a tomato shortage well that time they are planning to turn it to a mud battle so be ready, bring your goggles or something to cover your eyes. It is going to be a messy weekend! Of course there is going to be music and alcohol and lots of fun stuff… Bring your clean clothes to be able to go back home clean if you want. They are expecting thousands of people; battle begins at 4pm and ends around 6pm so get ready to be really dirty and covered with tomatoes. If you are planning to join Good Luck!!!! Trader Joe’s is in Plano..They just opened it today Friday September 7th, 2012 morning. Southern California Specialty Grocery Chain is very famous with No Artificial Flavors or Colors, No Preservatives food their own brand Trader Joe’s products. This 14,000sqft grocery chain is on Northeast Corner of Park and Preston in Plano. They say it is going to be pretty croweded this weekend but everything would be just fresh! !